Retrofit Kit (applicable to serial numbers JSX0003 thru JSX0022). Kit parts in-production and are estimated to ship by the 2nd quarter of 2019. 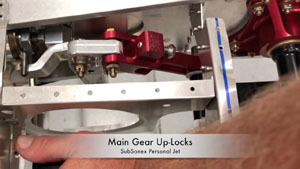 All new SubSonex Personal Jet orders under current pricing will include Up-Locks, and Upgrade Kits are available to existing customers.